← Why Does Judaism Look So Much Like Other Ancient Religions? Most of us never stop to think about modern biblical scholarship, and in the Orthodox community my impression is that it’s generally viewed as either a danger to be avoided, or a seriously misguided approach to the Torah and the rest of the Bible. But is this really true? 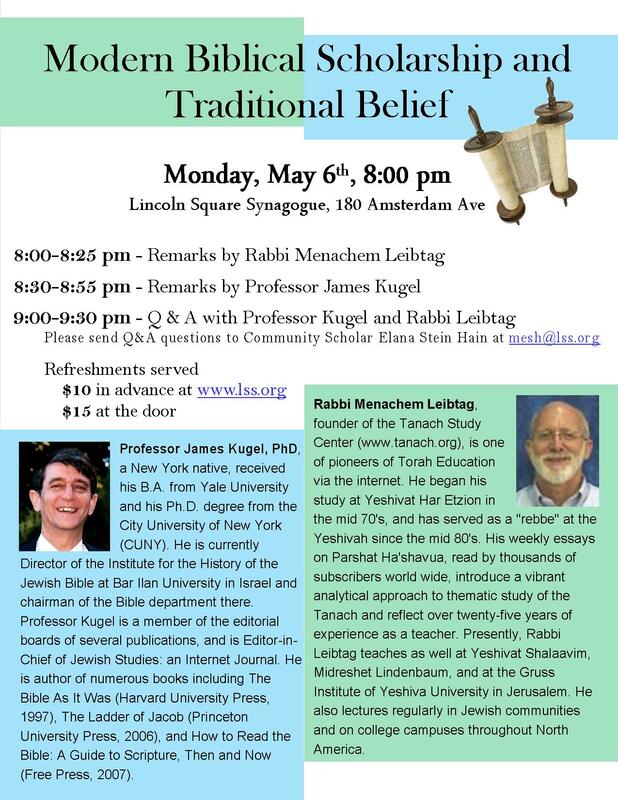 Lincoln Square Synogogue’s Community Scholar Elana Stein Hain just organized a forum on the topic, with two presentations and a question and answer session from two of the most prominent Orthodox Bible scholars today, Rabbi Menachem Leibtag and Dr. James Kugel. Rabbi Leibtag is a teacher at the Har Etzion Yeshiva, as well a prominent teacher, lecturer, and writer on TaNaKh (Bible). He regularly lectures in both Israel and North America. Dr. Kugel, a world renowned expert on Biblical scholarship and author of “How To Read the Bible” (among other fascinating works), was a professor at Harvard before retiring to Israel and Bar Ilan University. Both speakers were superb, and I want to share some interesting points I wrote down from their presentations and answers. I’m a long time Kugel fan, so getting to hear him was very exciting for me, and I actually (and probably very awkwardly) asked him to take a photo with me. Why not? I’ve never heard Rabbi Leibtag before, but I’ve heard high praise lavished on him, and he didn’t disappoint. I’m definitely going to check out his writings now, and I’m excited to learn some new things. One of the most interesting points that came out of the evening was a fundamental disagreement between Dr. Kugel and Rabbi Leibtag, but I’ll get to that later. Rabbi Liebtag spoke first. He was an entertaining speaker with some surprising views, but I think his perspectives would be considered a lot more mainstream in Israel. If I understood him correctly, Rabbi Leibtag views modern biblical scholarship as a tool in studying Torah. This means that while we believe (unshakably) that God gave us the Torah, we don’t know exactly how this took place. Modern scholarship delves through history to find out what actually happened, and thus sheds light on this question. This can be compared to modern science telling us how God created the world. It is our belief that He did so, but we don’t know how, exactly. Science and modern scholarship become tools to answer these questions, though in Leibtag’s opinion, archaeology is still in the baby stage. This being the case, scholarship is not only not a danger, but a useful tool in our toolbox (this is his phrase). The problem with modern scholarship really comes in when it comes to teaching it. In Rabbi Leibtag’s opinion, God created the world to have nations. He then chose one nation as His servants in order to bring Godliness to the world. This is the goal of the Torah, and the question is what role scholarship plays in this goal. The goal of Godliness may be likened to a bridge. When building the bridge, we need many parts. The cement, the pillars, etc. Sometimes we need to replace parts, and so too we sometimes replace parts in our belief system. In his opinion, the parts we replace should not be viewed so much as traditional beliefs, but as traditional understandings of traditional beliefs. Thus, our understanding until this point in time did not include modern scholarship. Now it does, and our understanding has been somewhat adjusted. However, the tool of modern scholarship is a “power tool”, and it’s not for kids. When we replace parts of the bridge, we need to do so carefully. If you’re ready, it’s a great tool. If you’re not, the bridge may fall apart. That was really his main speil, I think. Importantly, he mentioned that he believes we should bring new understandings to the Torah. He quoted his teacher Rabbi Bruer as saying “You should read Torah like Rashi did: Without Rashi”. Therefore, while some understandably take the approach that a new interpretation must be wrong or one of our past interpreters would have thought of it already, the best approach is actually to read the Torah anew in every generation. If we did not do this, no one would ever have written a commentary after Rashi, or Ramban, etc. Tied into this point is the role of subjectivity in reading the Torah. While there are many objective tools (language and theme connections, contradictions, similar stories, etc.) in the end we make a subjective choice of how to understand the Torah, and this is our hiddush, novel understanding. The Torah is not a book which makes simple clear points like a law book, which wants you to know exactly how to act. Rather, the Torah has many different voices, repetitions, contradictions, and styles, all of which invite the reader to delve into the text, rather than to skim it. To simply read the Torah like a book of directives is to miss how one should read Torah. His quote of the night was in regards to this. In his pithy phrasing the Torah is “not an artscroll how to think book.” It takes effort to read it, and we have to engage in deep study and thought to use objective tools to come to a new subjective conclusion. Part two will follow with some of Dr. Kugel’s remarks. If you’d like to submit a guest post or response, please contact me on Facebook or Twitter. Nobody, including you Yitz (if I may be so presumptuous), really believes IN the Torah. At most, we believe that our ancestors taught us that the Torah was God’s word. Well, u know that is a whole different kettle of fish. Now what makes OUR ancestors’ teaching any more valid than the OTHER guys’ ancestral teachings? If teachings of the ancestors is so important, than maybe the teachings of THEIR ancestors is true. Many other religious teachings do NOT jive with OUR mesorah. In other words, we r right, and they r wrong, when there r clear contradictions among many of them? Now what makes “US” right and “THEM” wrong? Because we say so? Because OUR fathers taught us that THIS is the God-given way of truth? Now, by any logical system, how valid its THAT? Look, MY mother’s chicken soup is way better than YOUR mother’s soup, right? MY dad can whoop YOUR dad. The very fact that u can say YOUR mother and dad r “better,” I can retort that MY parents r better. This belief is pure nationalism, nothing more. MY God is the best (forget the holocaust for a second). MY ancestral teachings r the best (forget slavery, genocide). MY book (the old Testament, for example) is truer than YOUR book (the new Testament or the Quran). Let’s get off our high horse, Yidn. We have no monopoly on the truth. I’m pretty tired now, but I certainly agree with you that Judaism cannot be something we do for our own benefit. We serve God, not the other way around. That doesn’t mean everyone suddenly has to worship God for the sake of serving God. One step at a time. I also agree that finite humans can’t have a monopoly on the truth. We all do our best, whatever religion or group we are. Very old school, Yitz. In the last few decades, the Orthodox have finally acknowledged the question of why the infinite God needs, or even wants, man’s service and beliefs. The new approach, however, does not hold water. Now they say that God demands service and tests from man to benefit man, not Himself. Somehow these mitzvot, and trials, and tests, have the power to ennoble man, to bring us to higher levels of spirituality and holiness, or something like that. So that man’s serving God is ultimately self-serving. What nonsense! We pray to God, even though He is indifferent to it, because it make US feel better? But if we know that He does not NEED (and seldom responds to) our prayer, the placebo effect is gone, and prayer does NOT ennoble us. If HE does not care, why should WE care? If God does not particularly like barbecued meat (even though the Bible often says that the smell pleases Him), why did He not command we offer this meat to the poor, rather than burn it. Yitz, the contradictions in Judaism r too much to wash away. Jewish thinkers have every right to question whether God gave us laws at all. I think we’ve discussed these questions over some different posts, and I’ve posted about them as well. By no means do i claim that I have all the answers, or that with more study your questions would simply go away. You’ve asked a lot of strong questions, and we’ll all need to live with a little bit of uncertainty (or maybe a lot, depending on who you are) no matter where we land on these important questions. I’ll also remind you that Jews have never avoided these questions, or at least, our literature hasn’t. It may be that a lot of literature over the years has, and that might be more true than ever now. None the less, if you wanted to become a scholar just of literature that dealt with the questions you have, you’d be quite busy. Let’s dispel once and for all the canard that Judaism encourages questions regarding faith and philosophy. If the questionee is quite sure he knows the answer in advance—that God and Torah r globally true (even if questions of detail remain)— then he is merely “begging the question,” not addressing it. Take Philosophy 101 at any university (that does not have a dogma to defend), and u will see the fallacy of knowing the answer before u know the questions. When I took this course, at Yeshiva U., the seemingly-Observant prof fully assured me that NON-belief in God, Torah, Judaism, is a highly-defensible position by all rules of philosophy and logic. My point: Judaism does NOT welcome real questions. You’re raising a very interesting point here. Does Judaism want us to ask the kinds of questions that may contain heretical answers? While this is a good question, the answer seems to be a simple one. Judaism assumes itself to be true. Therefore, you may study anything, and it is assumed you will not contradict it. That doesn’t mean that different rabbinic opinions will not put a limit on study and questioning, by the way. Surely, some do. Just yesterday someone quoted David Weiss Halivni as saying that it is permitted to study anything, but it is not permitted to set out to disprove Judaism. That’s not quite the same thing as what we are discussing, anyway. I assume that all of your questions come from your desire to know the truth, and not that you are out to “get” Judaism. I don’t know who your teachers have been, but while some people may think Judaism stifles the mind, and does not want us to ask questions, this is far from the Jewish way. The Jewish way is to encourage questions, even ones that don’t have easy answers. Chief Rabbi Jonathan Sacks has written on this in his Haggada, so I recommend taking a look at that if you’re interested.